Letters from Gondwana. | Paleontology, books and other stuff. The Archaeopteryx story began in the summer of 1861, two years after the publication of the first edition of Darwin’s Origin of Species, when workers in a limestone quarry in Germany discovered the impression of a single 145-million-year-old feather. Over the years, eleven Archaeopteryx specimens has being recovered. The new specimen from the village of Schamhaupten, east-central Bavaria is the oldest representative of the genus (earliest Tithonian). The shoulder girdles and arms, as well as the skull have been slightly dislocated from their original positions, but the forelimbs remain in articulation. The skull is triangular in lateral outline and has approximately 56 mm long. The orbit is the largest cranial opening (approximately 16 mm long), and the lateral temporal fenestra is collapsed. There are probably four tooth positions in the premaxilla, nine in the maxilla and 13 in the dentary. The postcranial skeleton was affected by breakage and loss of elements prior to or at the time of discovery. Patagonia has yielded the most comprehensive fossil record of Cretaceous theropods from Gondwana, including Megaraptora, a clade of medium-sized and highly pneumatized theropods represented by Fukuiraptor, Aerosteon, Australovenator, Megaraptor, Murusraptor, and Orkoraptor, and characterized by the formidable development of their manual claws on digits I and II and the transversely compressed and ventrally sharp ungual of the first manual digit. Tratayenia rosalesi is the first megaraptoran theropod described from the Santonian Bajo de la Carpa Formation of the Neuquén Group. The genus name is for Tratayén, the locality where the holotype was collected. The specific name honors Diego Rosales, who discovered the specimen in 2006. Tratayenia is also the largest carnivorous taxon known from Bajo de la Carpa Formation, reinforcing the hypothesis that megaraptorids were apex predators in South America from the Turonian through the Santonian or early Campanian, following the extinction of carcharodontosaurids. Sauropods were the largest terrestrial vertebrates. Their morphology is easy recognizable: a long, slender neck and a tail at the end of a large body supported by four columnar limbs. Sauropods dominated many Jurassic and Cretaceous terrestrial faunas. Although they were globally distributed, the absence of Diplodocoidea from East Asia has been interpreted as a biogeographic pattern caused by the Mesozoic fragmentation of Pangea. Lingwulong shenqi — literally the “amazing dragon from Lingwu” — is the first well-preserved confirmed diplodocoid from East Asia (23 synapomorphies support the placement of Lingwulong within Diplodocoidea with 10 of these being unequivocal). The holotype, (LM) V001a, is a partial skull comprising the braincase, skull roof, and occiput, and an associated set of dentary teeth. The paratype, (LGP) V001b, comprises a semi-articulated partial skeleton including a series of posterior dorsal vertebrae, complete sacrum, the first caudal vertebra, partial pelvis, and incomplete right hind limb. The Lingwulong specimens were found in the Yanan Formation at Ciyaopu, in northwest China. The presence of a conchostracans assemblage (including Palaeoleptoestheria, Triglypta, and Euestheria) is indicative of a Middle Jurassic age. The discovery of Lingwulong undermines the EAIH (East Asian Isolation Hypothesis), forcing a significant revision of hypotheses concerning the origins and early radiation of Neosauropoda. Ingentia prima — literally the “first giant” in Latin — from the Late Triassic of Argentina shed new lights on the origin of gigantism in this group. The holotype, PVSJ 1086, composed of six articulated posterior cervical vertebrae, glenoid region of right scapula and right forelimb lacking all phalanges, has been recovered from the southern outcrops of the Quebrada del Barro Formation, northwestern Argentina. Discovered in 2015 by Diego Abelín and a team led by Cecilia Apaldetti of CONICET-Universidad Nacional de San Juan, Argentina, this new fossil weighed up to 11 tons and measured up to 32 feet (10 meters) long. Ingentia was unearthed with three new specimens of Lessemsaurus sauropoides. The four dinosaurs belongs to the clade Lessemsauridae, that differs from all other Sauropodomorpha dinosaurs in possessing robust scapulae with dorsal and ventral ends equally expanded; slit-shaped neural canal of posterior dorsal vertebrae; anterior dorsal neural spines transversely expanded towards the dorsal end; a minimum transverse shaft width of the first metacarpal greater than twice the minimum transverse shaft of the second metacarpal; and bone growth characterized by the presence of thick zones of highly vascularized fibrolamellar bone, within a cyclical growth pattern. Caelestiventus hanseni, from the Upper Triassic of North America, is the oldest pterosaur ever discovered, and it predates all known desert pterosaurs by more than65 million years. The holotype, BYU 20707, includes the left maxilla fused with the jugal, the right maxilla, the right nasal, the fused frontoparietals, the right and left mandibular rami, the right terminal wing phalanx and three fragments of indeterminate bones. The maxilla, jugal, frontoparietal, and mandibular rami of the specimen are pneumatic. The unfused skull and mandibular elements suggest that BYU 20707 was skeletally immature or had indeterminate growth. Based on the relationship between the length of the terminal wing phalanges and wing span in other non-pterodactyloid pterosaurs the new taxon would have a wing span greater than 1.5 m. The significance of C. hanseni lies in its exceptional state of preservation, and its close phylogenetic relationship with Dimorphodon macronyx, indicating that dimorphodontids originated by the Late Triassic and survived the end-Triassic extinction event. Macrocollum itaquii is the oldest long-necked dinosaur known. Discovered in 2012, from rocks belonging to the upper part of the Candelaria Sequence constrained as about 225 Ma, the three individuals described as M. itaquii are relatively well preserved. The holotype specimen (CAPPA/UFSM 0001a) consists of an almost complete and articulated skeleton. The two paratype specimens (CAPPA/UFSM 0001b and CAPPA/UFSM 0001c) are both articulated skeletons with one missing a skull and its cervical series. The clustered preservation of the three skeletons also represents the oldest evidence of gregarious behaviour in sauropodomorphs, a pattern seen in other Triassic associations, such as the ‘Plateosaurus bonebed’ from Central Europe, and the Mussaurus remains from the Laguna Colorada Formation, Argentina. 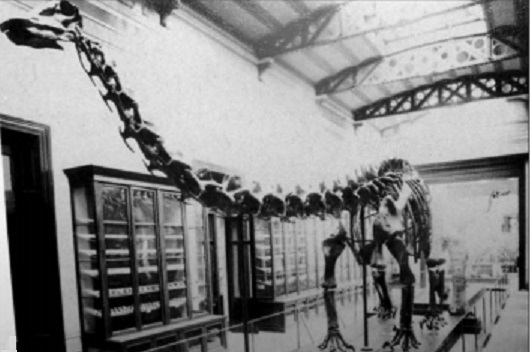 M. itaquii was only 3.5 meters long and weighed about 101.6 kilograms. In contrast to most Carnian members of the group, the teeth of M. itaquii and other Norian taxa are fully adapted to an omnivore/herbivore diet. The neck elongation may also have provided a competitive advantage for gathering food resources, allowing members of the group to reach higher vegetation. The modifications of the hindlimb of M. itaquii could be related to the progressive loss of cursorial habits. During the Norian, the evolution of ichthyosaurs took a major turn, with the appearance of the clade Parvipelvia (ichthyosaurs with a small pelvic girdle). They were notably similar in appearance to extant pelagic cruisers such as odontocete whales. An exquisitely fossilized parvipelvian Stenopterygius from the Early Jurassic (Toarcian) of the Holzmaden quarry in southern Germany, indicates that their resemblance with dolphin and whales is more than skin deep. The specimen (MH 432; Urweltmuseum Hauff, Holzmaden, Germany) reveals endogenous cellular, sub-cellular and biomolecular constituents within relict skin and subcutaneous tissue. The external surface of the body is smooth, and was presumably comparable in life to the skin of extant cetaceans. The histological and microscopic examination of the fossil, evinced a multi-layered subsurface architecture. The approximately 100-μm-thick epidermis retains cell-like structures that are likely to represent preserved melanophores. The subcutaneous layer is over 500 μm thick, and comprises a glossy black material superimposed over a fibrous mat. The anatomical localization, chemical composition and fabric of the subcutaneous material is interpreted as fossilized blubber, a hallmark of warm-blooded marine amniotes. Feathers were once considered to be unique avialan structures. Recent studies indicated that non avian dinosaurs, as part of Archosauria, possessed the entirety of the known non keratin protein-coding toolkit for making feathers. Primitive theropods, such as Sinosauropteryx and the tyrannosaurs Dilong and Yutyrannus, and some plant-eating ornithischian dinosaurs, such as Tianyulong and Kulindadromeus, are known from their spectacularly preserved fossils covered in simple, hair-like filaments called ‘protofeathers’. Other integumentary filaments, termed pycnofibres, has been reported in several pterosaur specimens, but there is still a substantial disagreement regarding their interpretation. J. Yang and colleagues described two specimens of short-tailed pterosaurs (NJU–57003 and CAGS–Z070) from the Middle-Late Jurassic Yanliao Biota, in northeast China (around 165-160 million years ago) with preserved structural fibres (actinofibrils) and four different types of pycnofibres. The specimens resemble Jeholopterus and Dendrorhynchoides, but they are relatively small. Pterosaurs were winged cousins of the dinosaurs and lived from around 200 million years ago to 66 million years ago. In the early 1800’s, a fuzzy integument was first reported from the holotype of Scaphognathus crassirostris. A recent study on this specimen shows a subset of pycnofibers and actinofibrils. The discovery of integumentary structures in other pterosaurs, such as Pterorhynchus wellnhoferi(another rhamphorhynchoid pterosaur), and these exquisitely preserved pterosaurs from China, suggest that all Avemetatarsalia (the wide clade that includes dinosaurs, pterosaurs and close relatives) were ancestrally feathered.